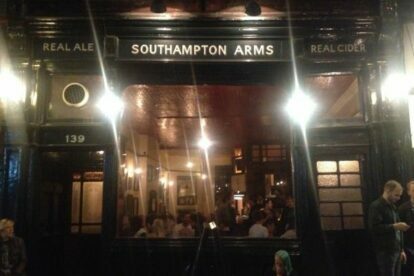 The Southampton Arms is London’s best pub. It has 18 handpulls pumping out real ale and traditional cider from small independent British breweries. It serves a mean hog roast pork roll with apple sauce and crackling. It has a record player and a piano. It has a pet cat. It has a sense of humour. It has everything that a pub should have, but nothing that it shouldn’t. A quick browse through the understated website shows that the owners do not care for distractions such as table reservations, card payments or telephone enquiries. They care for great beer, refreshing cider, tasty meat and having a good time. The drinks selection changes throughout the day / evening, as each keg runs dry. And as such I can’t recommend a particular tipple; it’s best to ask the bar staff for advice and try a couple of tasters. They’re all good. You won’t be disappointed.